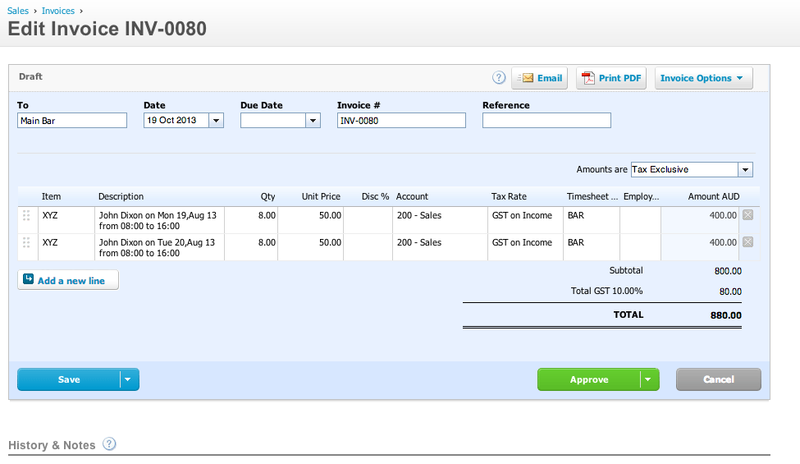 Deputy supports timesheets as invoices through Xero. Along with exporting timesheets in Xero Payroll, Deputy can export timesheets as invoices for billing clients or contractor issued invoice. For general preparation on timesheet export, view this article. This is ideal if your employees have worked with customer and you want to bill time worked to customers (e.g. Recruitment companies). Deputy does not have CRM capability so we will assume you are using Deputy's scheduling area's or locations as customers. You can certainly setup Customer names such as "ABC Pty Ltd", "ACME Ltd" as scheduling areas or locations. Select All, and choose "Export Selected Items". Choose "Xero Invoice (Accounts Receivable Per Area)". You may need to Connect to Xero here to establish connection between Deputy and Xero. Item: Specify the item from Xero Inventory. Please note, if you select an item code, it will ignore the % markup above and use the selling price specified with the item. You can magic map Area Export Codes to Item code. 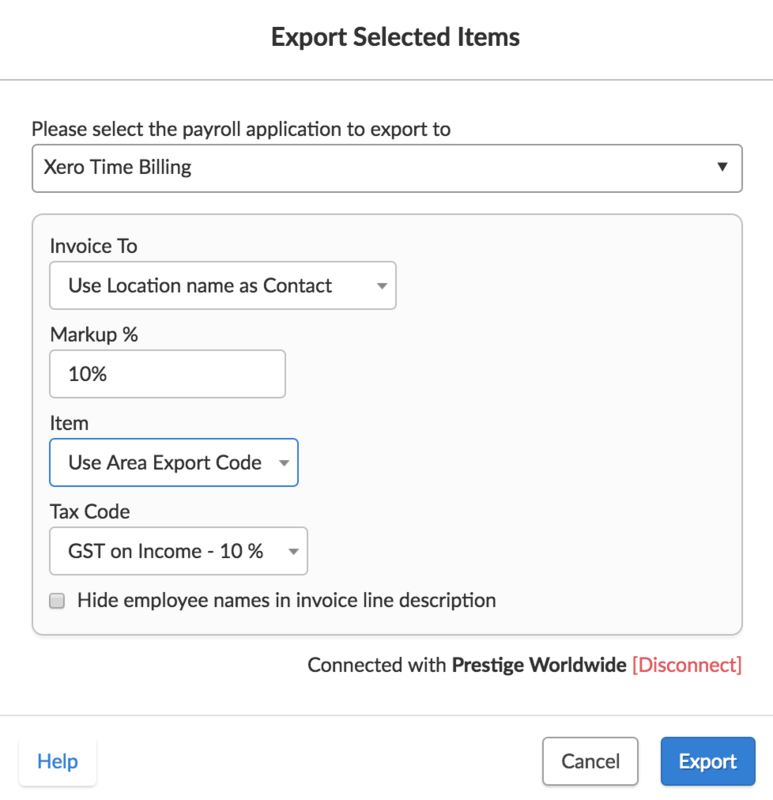 To edit the area export codes, go to Settings of your location, then Roster/Scheduling areas and edit the area to have the Xero Item Code in the export code field. Hide Employee Names: Deputy created invoice will include the employee name by default. If you want to hide it, select this option. Once you export the selected timesheets, an invoice will be created per area of timesheet. You may have 10 employees working in 3 separate areas with 90 timesheets for the week. This will generate 3 invoices with 'customer' as the area name and each timesheet as a separate line. It will automatically match tracking categories based on area's export code. Deputy will automatically match the best inventory item for the timesheet. The invoice lines will be created for exact hours done on the day. E.g. for a shift beginning at 8pm Friday to 3am Saturday, will go in with 4 hours of Friday rate and 3 hours of Saturday rate. Just as much you can generate invoices for customers, you can also generate self-issued invoices for contractors for the hours they have worked. Usually in contractor industry (be it Tech, Design, outsourcing etc), you have to wait for the invoice from the contractor to pay them. In Deputy, since you can truly track the hours of work you can just pay them! Similar as above: select "Xero Invoice (Accounts Payable per Employee)"
Account: which account the invoice lines should be using? 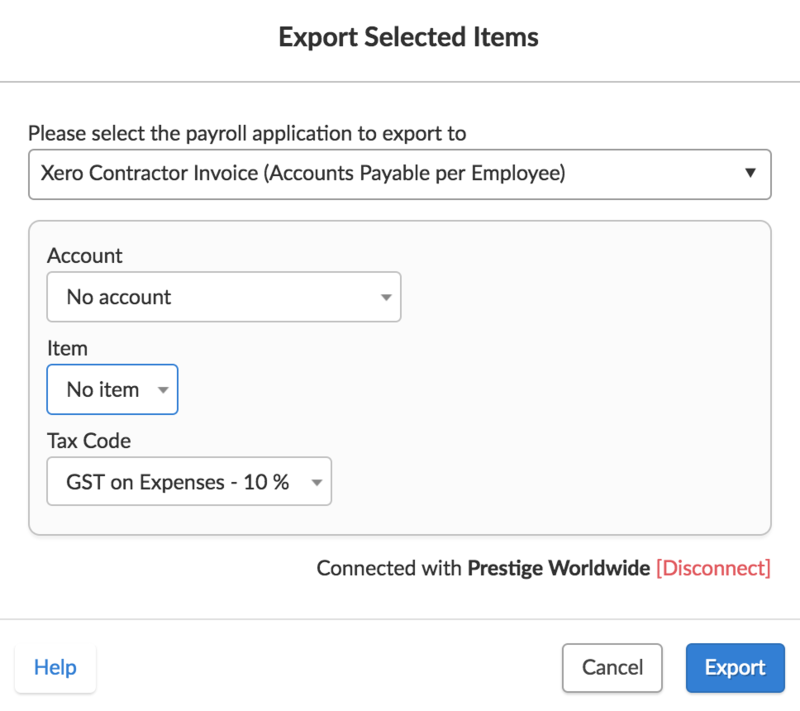 Hit Export and it will create one invoice per Employee. It will automatically match tracking categories per invoice line based on the "Export Code" of the areas.